Before harvesting radishes, it's important to take a close look at the base of the plant. In most cases, the top of the radish should be visible. If it's not, take a good look at the top of the plant. If the top is large and green and 6-8" long, the radish is probably ready for harvest. It's always better to harvest radishes a little too early as opposed to waiting too long. When radishes are over-ripe, they get woody and pithy and aren't nearly as tasty. We'd much rather eat a tasty radish that was a bit on the small side as opposed to a larger radish that was woody and didn't taste very good. When harvesting radishes, grasp the entire top firmly as close to the soil as possible and give it a gentle tug. The entire radish should come out fairly easily. Sometimes it helps if the soil is a little wet. You can water the plants a couple of hours prior to harvesting to make harvesting easier. their texture and flavor will start to deteriorate significantly. 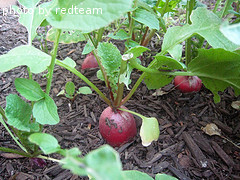 Once the radishes are harvested, you can cut off the tops, leaving about 1/2 inch of stem. The tops can be washed and dried off with a salad spinner. They will keep nicely for 3 days or so in a non-airtight bag in the crisper drawer in your refrigerator. 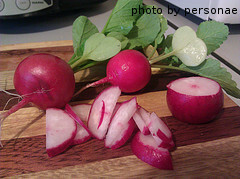 The radishes themselves can also be washed and stored in the refrigerator in a non-airtight bag. They will last for a couple of weeks. The reason for not storing them in an airtight container is that gases will build up and cause the radishes to spoil more quickly. If we have room in our fridge, we usually just keep them in a bowl until we're ready to cook or pickle them. For long term storage, radishes can be pickled using your favorite pickling recipe. We like to use a sweet pickling liquid for radishes because we find that it contrasts nicely with the spiciness of the radish.